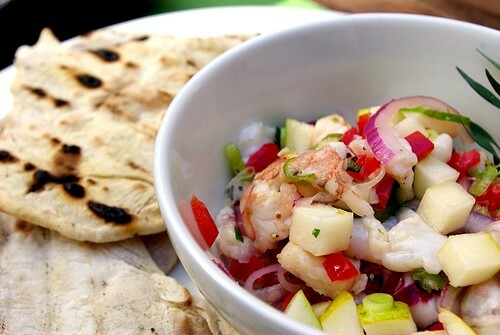 scallop, shrimp, sea bass, pear and tarragon ceviche with grilled white chapatis, originally uploaded by aarn! +27th April, 2009+. marinated 1/2-lb of raw scallops, 1/4-lb of raw shrimp, and 1/4-lb of sea bass, all of which had been sliced into rounds or cubes about 1/3-in thick, in the juice from four lemons and four limes, the zest from one lime, 1/2 of a red bell pepper finely chopped, 1T. of finely chopped habenero pepper, two cloves of crushed garlic, and 1t. of salt. let this stand covered in the refrigerator for one hour, lightly mixing once or twice along the way. strained most of the marinating liquid and added to the seafood and pepper mixture: 1/4c. of extra-virgin olive oil, diced 1/2 of a large pear, finely sliced 1/4 of a red onion, 2 finely sliced scallions, 1 1/2T. of finely chopped fresh tarragon, 1t. sugar, and fresh cracked black pepper to taste. mixed 3/4c. of warm water and 1t. of salt into 1 3/4c. all purpose flour, kneaded and let stand for 30 minutes at room temperature. took globs of the goo with a floured hand and pushed them into rounds and stretched to shape on a floured work surface, then placed each flattened dough piece on a low temperature grill until slightly charred and still moist on the inside. the best tasting ones were puffed full of air but still a little gummy around the edges. plated the ceviche in chilled bowls on a larger plate with the chapatis and a sprig of tarragon. a glass of oyster bay sauvignon blanc was paired with this dish. This is a great blog with fascinating recipes! I have a difficult time reading the recipes when they are all in one paragraph though. this looks like a great recipe for the barbecue i am going to this weekend, how many people did that feed? i want to get the proportions right. Thanks! And yeah, I wanted to kind of do something different, to make this blog a little less like a cook book, so the paragraph recipes are kind of my style. It's kind of like an open-source cooking stream of thought. Two of us ate most of this for dinner, as the main course. I got the seafood to citrus ratio from cooks illustrated, and their dish serves six as an appetizer. I would double the chapati recipe if you are going to serve more than two or three. This maybe an amateur question but from the looks of it, the shrimp, sea bass, and scallops stay raw. Can you eat this kind of seafood if you buy it raw from (unfortunately) a place like Albertson's or Huckleberry's? I splurged on seafood from whole foods for this dish. Usually I would hit the local fish market, but I just happened to be in the area and was on foot. This technique is really about the freshness of all of the ingredients. I have heard of using canned, frozen, or cooked fish to do a ceviche-like dish, that may be a safe place to start if you are worried about the quality of your supply. Using citric acid to cook does alter the appearance of the sea bass, scallops, etc., you can tell the difference between raw and denatured with citric acid. I would use the ratio of 1-lb of fish to the juice of 8 lemons or limes (or a combo), and make sure to let it sit in a refrigerator for an hour or so. There is a lot of information out there on different types of ceviche dishes, also maybe check out the wiki page on ceviche for some more details on the technique.